Tagged Anthony Bourdain, Applique, English Paper Piecing, EPP, EPP Starflowers, hand quilting, Little Baskets, rose of sharon. Bookmark the permalink. Beautiful blocks and fantastic stitching! Just lovely. Both of your rainbow block choices are such fun designs. They’re going to be wonderful quilts. Great progress this week on your hand quilting. I always like your baskets! The Starflower block is really pretty, too! I’ve never watched much of Anthony Bourdain’s shows – thanks for sharing the links. I’ve always loved the freshness of the color teal, but what a frustration getting it to coordinate with primary blue! Scrap basket projects seem to work, though! Hello, I love the starflowers and your rose of sharon quilt. Lovely work. Enjoy your day and weekend! 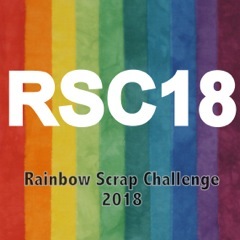 The whole point of the RSC is to USE your scraps!! You’ve done that. I’d count that a WIN! I am a big fan of Baptist Fan style quilting. Lookin’ good! Loving the quilting on the Rose quilt. It’s just stunning. I’m not sure I have the patience for hand quilting. I just love seeing this fan quilting on your pretty quilt! You managed to find some teal for your hand sewing too! Great job. I’m not sure how you get as much quilting done as you do with your gardening and mowing. :-) Yes, it has been a tough week for news regarding the loss of lives to suicide. I heard a stat yesterday that the suicide rate in NH is up 48%. Sobering how much we need to address mental health issues. Love the texture you are creating with the hand quilting – so lovely…and nice choices of teal fabrics for your work in progress. I agree, teal is not a color easily found in reproduction fabrics. I love teal. It is one of my favorite colors to wear. I am in love with your quilting. It is gorgeous. I can’t get enough of those baptist fan photos! Have a relaxing Slow Stitching Sunday! Lovely blocks and gorgeous hand quilting!! Love your little basket and texas star blocks! I am using some 1800’s repros I purchased in a scrap bag. It’s really fun picking two different prints to put together for my hour glass blocks. You have come along way with your hand quilting. Your quilt looks so cozy.